When friends heard about my cooking extravaganzas (er.. all right, week night dinners), the ones who actually prepare meals would ask if I’d be trying Chefs Plate. Indeed, it seems to be Toronto’s most popular service having been around for a couple of years. 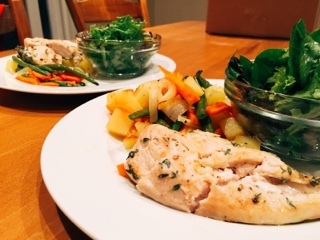 Friends rave about the easy to prepare meals – one who’s moved into a temporary rental even able to cook for a family with only one pot and pan. After all the praise, I was excited to try it for myself. 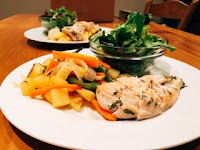 Monday – ideal for the weeknight cooks and fits into my schedule the best as I’m most likely eat a meal at home during Monday – Wednesday or Sunday. Thursday – a great option for individuals who predominantly have time to cook on weekends or may even want a meal kit for entertaining. Think about it, you get all the ingredients and if it doesn’t work out, you always have someone to fall back on. 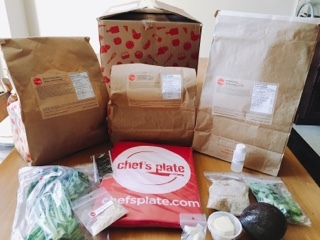 Of all the packaging, Chefs Plate’s box was the most impressive – regular cardboard but incorporates a built in foil reflective layer. Additionally, they seem to be the only company that didn’t freeze the proteins (so you can cook them on the delivery date), with an abundance of ice packs everything stays cold. A nice touch with the introductory box was a welcome pamphlet and an apron that really put me into the cooking spirit. Moreover, I enjoyed the paper bags containing all the ingredients for each dish – they’re sturdier and took up less space within the fridge. However, there was a mishap: the pizza dough that should have accompanied the calzones didn’t arrive. Had I read the pizza dough information card carefully, I should have realized it wasn’t in the bag and therefore would know it’s missing – unfortunately, I didn’t realize until I was about to cook for the evening. Good old Uber Eats saved the night. In following up with Chefs Plate, they noted a missing ingredient doesn’t happen frequently. However, if it does, their Customer Service group will refund the customer for the meal. My friends were right: the recipes were simple, straight forward, and no fancy gadgets were required. For two meals, I only needed a baking sheet. The salmon was the most “equipment intensive” requiring two frying pans and a pot. Additionally, the dishes were quicker to prepare – no recipe took more than 30 minutes. Chefs Plate helps save time by prepping ingredients more than any company: garlic cloves arrived peeled and the green beans were arranged in the same direction (a quick wash and one chop was all it took to remove the ends). 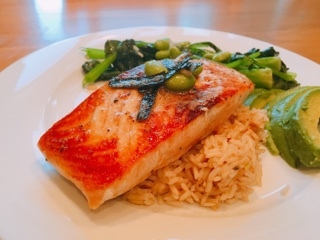 Trust the timing on the cooking instructions, they seemed a tad short but ensured restaurant quality doneness… the salmon was a beautiful jewel-toned medium in the middle and the chicken fairly moist. Everything was good but nothing wowed us. 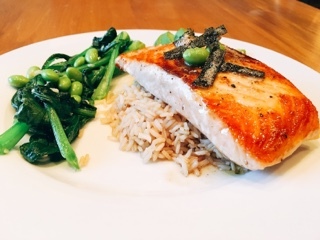 Take the nori salmon: the fish was cooked nicely but adding toasted nori slivers into melted butter for two minutes really didn’t infuse the butter with much flavour. The most pronounced taste was the rice wine vinegar tossed into the steamed rice, which was delicious and an idea I’ll re-use. And as a warning, don’t use a rice cooker (or at least use more liquid than called for in the recipe) as mine turned out al dante. 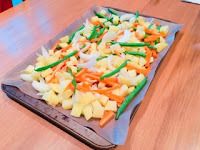 Despite the roasted vegetable medley accompanying the chicken being a tasty combination of potato (make sure these are actually cut to half an inch), onions, green beans and carrots, I found they needed something more than just garlic and olive oil. Another herb like rosemary likely would have paired nicely with the lemon thyme chicken. 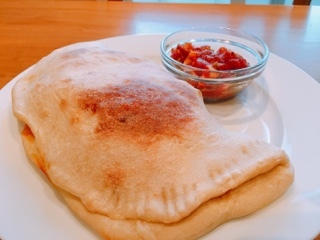 After buying my own pizza dough, I also made the cheese calzones. To be fair, it’s difficult to determine if I had too much dough (since recipes don’t include measurements) and if Whole Food’s pizza dough would be as good as what should have arrived in the kit. 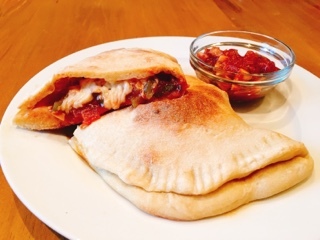 But, the calzones were also fairly bland – if I were to do it again I’d brush the dough with olive oil and sprinkle salt on top. Out of the three companies I’ve tried so far Chefs Plate is definitely the most polished. Of course, it was disappointing that such a long-standing company would have forgotten to include the pizza dough (a key ingredient for calzones)… guess the quality control person had a slip for the day. Overall, the recipes were quick and safe – there’s not a lot of spices, herbs or unfamiliar ingredients. So, I see the dishes being a good choice for family with young children or for those who are picky eaters. However, for a person who loves a diversity of flavours and eats out often, I couldn’t help but want more. Oh well, maybe my taste buds need a rest sometimes. Chefs Plate also offers two or four-person plans. However, you’re also allowed to choose the number of meals for the week (two, three or four), which is helpful for those who have an active social calendar and eating at home three times a week isn’t possible. The basic charge is $10.95 per serving for the two-person plan or $9.75 per serving for the four-person plan. A $6 delivery charge is tacked on for the two-meal two-person version, but still free if you’re ordering two meals for a family of four. It is of course free for any other plan. If the above has intrigued you, sign up and try a week for yourself. Chefs Plate is offering Gastro World readers three free plates on the first order for new customers. Just click on this special referral link to go to their website. Disclaimer: The above meal delivery was complimentary. Rest assured, as noted in my mission statement, I will always provide an honest opinion.